KINGSPORT, Tenn.- The Kingsport Mets announced their coaching staff for the 2019 Appalachian League season today. They welcome an all new staff that features a former major league and World Series champion coach, a former major league pitcher and a former KMets player. Rich Donnelly has been named Kingsport Mets manager, Jerome Williams will serve as pitching coach, and Rafael Fernandez as hitting coach. Former major league coach, Rich Donnelly, begins his first year managing the Kingsport Mets and his fifth season in the New York Mets organization, spending 2011-2013 as manager of the Brooklyn Cyclones. He served as a major league coach for 29 seasons, with the Mariners, Dodgers, Brewers, Rockies, Pirates, Rangers and most notably the Marlins, where coaching under manager Jim Leyland, he won a World Series Championship in 1997. Before his major league coaching days, Donnelly coached in the minor leagues for the Texas Rangers. He was originally signed by the Minnesota Twins in 1967 as a catcher and played four years in the Twins organization. Away from the ballpark, Donnelly is a motivational speaker and in 2018 Rich Donnelly's life and story was turned into a book, The Chicken Runs at Midnight. The book is based on his life and the passing of his daughter, Amy. Donnelly is a Steubenville, OH native and now lives in Pittsburgh with his wife, Bertie. Former major league pitcher, Jerome Williams begins his first season in the Mets organization and his first as a pitching coach after retiring as a pitcher in 2018. He played 11 years in the major leagues with the Giants, Angels, Cubs, Cardinals, Rangers, Nationals and Astros. He compiled a 52-66 record with 4.59 ERA in 236 career games. Williams was originally drafted by the San Francisco Giants in the first round of the 1999 first-year player draft. He resides in Mission Viejo, CA with his wife Sarah and their four children. Former KMets player, Rafael Fernandez begins his first season as the Kingsport Mets hitting coach and his fourth season with the Mets organization. He spent the previous three seasons as the hitting coach for Gulf Coast and DSL Mets. Fernandez was originally signed by the Mets in 2006 and played seven seasons as an outfielder in the minors, most notably when he played in Kingsport in 2008. Fernandez batted .259 with four home runs and 31 runs batted in playing in Kingsport. He currently resides in Tenares, Dominican Republic. Stephen Gaylor begins his first season as the Kingsport development coach and first overall in the Mets organization. He played in the Atlanta Braves organization from 2014 to 2018. Stephen played at every minor league level with the Braves from rookie ball to Triple-A. He graduated from Berry College in 2014 with a B.S. in Exercise Science and played three seasons at Berry College. Originally from Rome, GA, Stephen currently resides in Birmingham, Alabama with his wife Alexis and their dog Sadie. Anthony Olivieri begins his first season as athletic trainer for the Kingsport Mets. He spent last year in the same role with the Gulf Coast team and the previous year with the Mets Dominican Sumer League teams. Previously interned with the National Training Center/South Lake Hospital at ESPN Wide World of Sports complex in Disney. Olivieri graduated with a bachelor of science in Athletic Training and a minor in Health Education from Kean University (NJ). He currently resides in Rutherford, NJ. Seth Gregorich begins his first season as the Performance Coach with the Kingsport Mets and his third year with the Mets organization. He previously worked the last two years in the same role with the Gulf Coast team. Prior to joining the Mets, Gregorich was the strength and conditioning coach for Clearwater of the Florida State League in 2015 and 2016. In 2014, he was the strength and conditioning coach for the GCL Tigers. Gregorich graduated with a B.S. in Health and Human Performance with an emphasis in Coaching from Bellevue University (NE). He currently resides in Port St. Lucie, FL with his wife, Stacey. 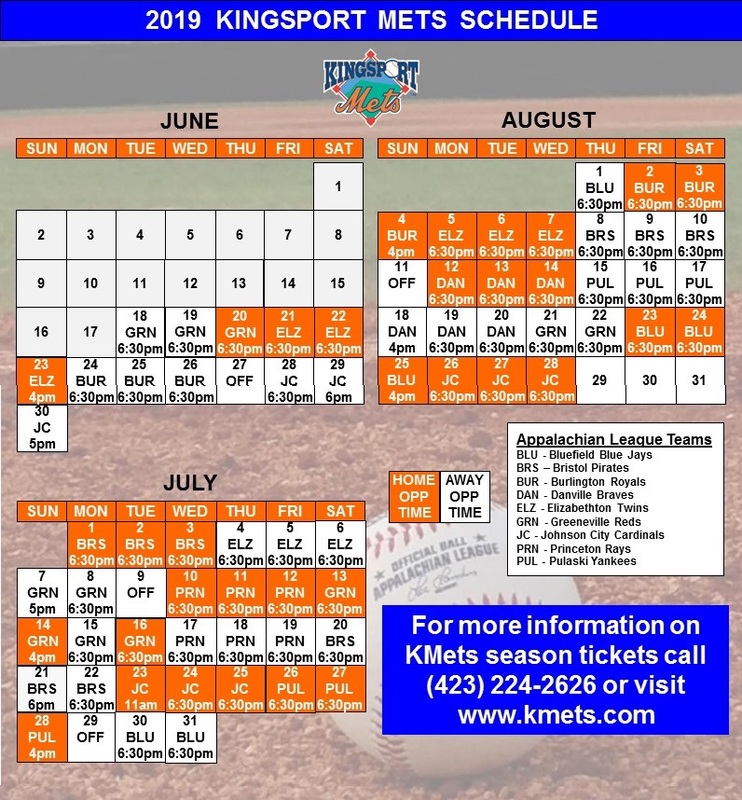 For more information on the 2019 Kingsport Mets season, season tickets and sponsorship opportunities please contact the Kingsport Mets office at (423) 224-2626, email at info@kmets.com or log on to www.kmets.com. Check us out on Facebook and follow us on Twitter.